. @TeddyOutReady: Dive Into Action With Aquaman & The Justice League, LEGO DC Comics Super Heroes: Aquaman – Rage of Atlantis is Available on Blu-ray & Digital | WarnerBros. Dive Into Action With Aquaman & The Justice League, LEGO DC Comics Super Heroes: Aquaman – Rage of Atlantis is Available on Blu-ray & Digital | WarnerBros. We like watching LEGO movies when you dive into the world where everything and everybody made of LEGO blocks. 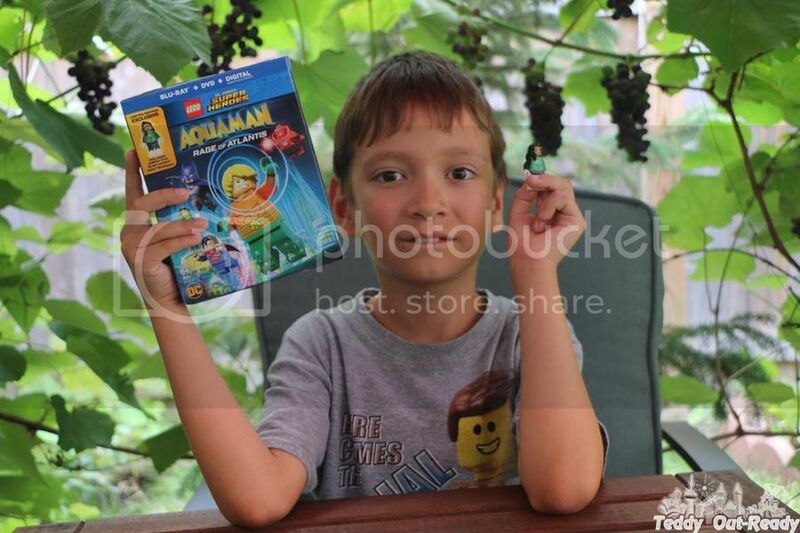 The recent Warner Bros. Home Entertainment release LEGO DC Comics Super Heroes: Aquaman – Rage of Atlantis Teddy was looking forward to watch. Summer is on its peak, it is hot outside, kids are on vacation and eager to enjoy Superheroes films. The movie starts with showing Atlantis, the Kingdom of Water and Wonder. The King of Atlantis must make some difficult decisions to ensure the future of his ocean realm. Under attack from Atrocitus and the Red Lanterns, Aquaman realizes he must find ways to get his water kingdom back and go on a journey to regain his confidence before returning to his rightful throne. Aquaman cannot fight the villains alone, the Justice League comes to Atlantis to help. While the most powerful team is on-site, it seems not that easy to conquer in the depths of the Seven Seas. Even Aquaman's wife joined Atrocitus army along with the whole population of Atlantis under the power of the Red Lanterns. Batman, Superman, Wonder Woman make a great team as usual, impressive with their skills but not enough to win Atlantis. At the same time Aquaman gets into silly situations and almost loses any respect as a powerful superhero. But when gets out of the Seven Seas with his friends from the Justice League, Aquaman learns how to use his abilities and, the most important, becomes confident in his plans and actions. Superheroes must conquer Atlantis enemies not only in the depths of the water but also in the air, on land and another planet! The newest member of The Justice League Jessica Cruz/Green Lantern plays a vital role in the battles, her abilities find new outcomes in difficult situations. Her mini-figure is included in our LEGO DC Comics Super Heroes: Aquaman – Rage of Atlantis movie set. Though superhero fights are usually very tough and destructive, in LEGO movies they end up in broken blocks. At the beginning of the movie we were not sure if Aquaman should continue to be The King of Atlantis, his behavior was amusing but not the king level. Even Queen Mera, his wife, finds his actions foolish. But as the story goes on you realize that Aquaman is more than just a funny character who lives underwater and talks to sea animals. Once troubles hit his Kingdom, he shows new abilities and some wisdom to fight back against villains ready to dry the ocean and take the water to their planet. 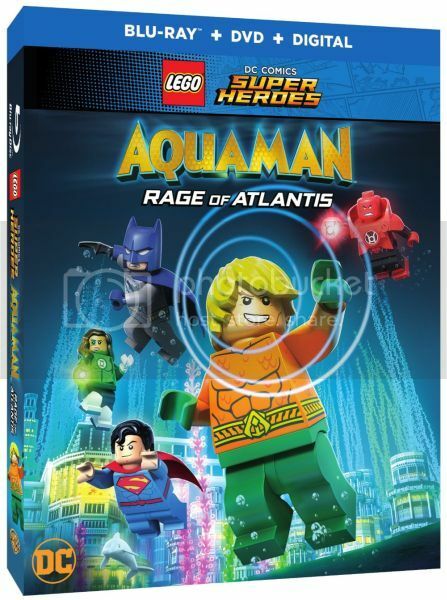 LEGO DC Comics Super Heroes: Aquaman – Rage of Atlantis is new story of underwater battles where lots of favorite superheroes are involved. Teddy finds this movie is similar to previous release LEGO® DC Super Heroes: The Flash but with new to him character - Aquaman. Overall, it was funny movie to watch and we liked how Atlantis is built of LEGO blocks. The movie is available on Digital and Blu-ray today, July 31!